We set out one Saturday morning to visit Santa, who just happens to be Mason’s favorite person lately. Or so I thought. Everywhere we go Mason spots out the smallest of Santa pictures, figurines, etc. and he yells with pure excitement “Santa!” So, I thought our visit to see the big guy would be so much more eventful than last year. Well, I was right on the eventful part, but not the kind I was planning on. Mason couldn’t wait to get through the line to see Santa. He was so excited and very impatient. I was getting excited myself because I just knew this year’s Santa picture would be perfect. As we approached Santa the excitement turned to pure fear. Mason wrapped his legs around me and started to cry out as if I was putting him on the lap of a monster. Being the softy I am, I stopped trying to coax my terrified munchkin to sit on Santa’s lap. Santa being the sweet jolly old elf he is, picked up on my hesitation and offered to let me sit down with him so that we could get a picture. He was just so sweet I wanted to pinch his cheeks. 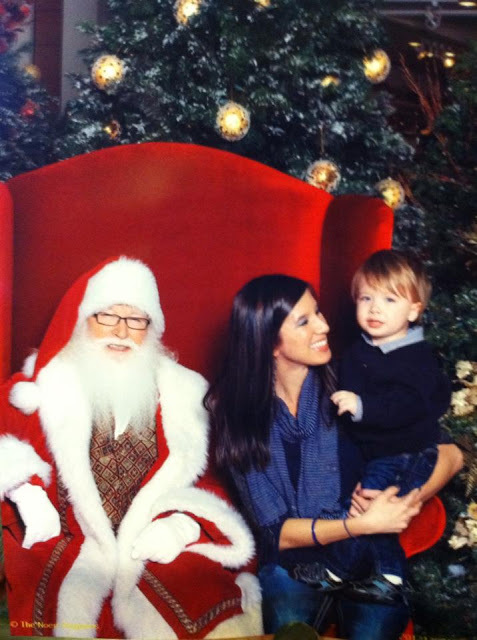 Share your favorite photo of your kiddo’s visit to see Santa.